This is the first game in the Mega Man Star Force series. 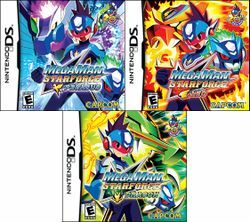 For other games in the series see the Mega Man Star Force category. Mega Man Star Force, known in Japan as Shooting Star Rockman, is a Mega Man action role-playing video game published and developed by Capcom for the Nintendo DS. It was released on December 14, 2006 in Japan, and was released in North America on August 7, 2007. The game was released in three separate versions simultaneously, subtitled Pegasus, Leo, and Dragon. However, the Dragon version is exclusive in North America to GameStop stores for the English localization. Mega Man Star Force has many similarities to the Mega Man Battle Network series, but is considered a separate entity. This page was last edited on 4 April 2016, at 20:26.